When health care reform passed Congress more than two years ago, Julie Walters yelled for her husband to come into the living room where she was watching the vote live on television. The historic vote meant their 18-month-old daughter, Violet McManus, would be able to keep her health insurance. Without health care reform, she would have gotten kicked off her parents’ insurance, perhaps as early as her 5th birthday, because her care is so expensive. But now Violet’s parents are worried they won’t be able to breathe easily again. This week, the Supreme Court is hearing a debate on health care reform. The court could keep the reform intact, repeal parts of it, or get rid of the law altogether. Violet has been hospitalized about six times and each hospitalization cost more than $50,000. She’s now on two drugs to control the seizures and carries oxygen with her wherever she goes because she stops breathing when she has her seizures. She needs speech therapy and frequent doctor’s visits. Matt McManus, Violet’s father, gets health insurance through his work as a video game designer. Before health care reform, there was a $5 million lifetime limit on Violet’s insurance policy. Violet is now 3 and her parents calculate she could hit that cap by her 5th birthday, and almost certainly by her 10th. And so it did. But that’s not all it did. 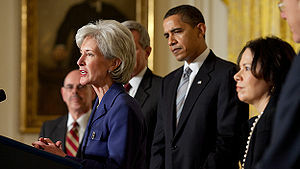 Obamacare also mandates insurance purchases, slashes Medicare, and grants boundless power to HHS Secretary Kathleen Sebelius to define what constitutes acceptable health insurance in America. And that’s the point. Comprehensive solutions like Obamacare leverage true problems to push through other, unnecessary government intrusions. Why does poor Violet have to be held hostage to special interests like Georgetown law students who don’t want to pay for their own birth control? Why can’t desperate situations like her family’s be sensibly addressed on their own merits, instead of as just another item in liberals’ all-you-can-eat health care buffet? “If Violet does lose her current insurance, her parents know there’s no way another insurance company will want to insure her because her care is so expensive. Ms. Walters is correct. But shouldn’t there be a better way to solve this problem than the government forcing an insurance company to act completely apart from its financial interest? Does Cohen, or did former Speaker Pelosi, believe insurance companies can be mandated to grow a heart? Unintended consequences are guaranteed to flow from any such law. If insurance companies have to cover the most dire and expensive medical cases, won’t they try to make themselves less attractive options for those patients? Only time will tell how they go about that. The troublesome aspect is that Obamacare creates that incentive. For example, 2.5 million young Americans get to stay on their parents’ insurance until their 26th birthday because of health care reform, according to the Obama administration. Seniors and people with disabilities have saved $3.2 billion on prescription drugs because of health care reform and insurance companies and 45 million women have received free mammograms and pap smears because of health care reform. He’s right. Liberals need to stop viewing the health care issue as a political power grab where they can give away endless “free” goodies in order to create a nation even more dependent on federal government, and more likely to vote Democrat. A different route would be one where effective, financially responsible solutions are passed into law, and Violet McManus is viewed as more than just a pawn. This entry was posted in Daily Breakdown and tagged CNN, Elizabeth Cohen, health care, Health care reform, Julie Walters, Kathleen Sebelius, media bias, ObamaCare, Patient Protection Affordable Care Act by frack. Bookmark the permalink.